What other jobs allow you to stay up all night long, party with crazy people, and get paid for it? That’s what I like to say every New Year’s Eve. New Year’s Eve is my favorite shift, and it’s because of the people. They are what keep me going in this career: the people, the crazy people, and I don’t mean just the patients. Docs, nurses and techs all have to be a little bit loony to enjoy this job as well. It is the best job in the world! I come to work not knowing exactly what I will be doing, and even while working we never know what’s going to happen next. Time-bombs are lurking in the humdrum of the daily routine. Our job is to identify them and defuse them. This keeps us on our toes, and this keeps me intrigued. When I can solve a medical puzzle, I am intellectually rewarded. When I can help someone I am gratified. When I can make a child smile I am happy. I can’t figure everything out or everybody out but I can sure have fun trying! This is why I continue my career of emergency medicine. Why did I make it my career in the first place? It looked exciting, isn’t that why we all chose it? Living in rural Haiti before medical school was my introduction to the field of emergency medicine. Having studied the religion, politics, and culture of the country as an undergraduate anthropology student, my move to the city of Leogane, Haiti in order to volunteer for the University of Notre Dame’s public health initiative to eradicate lymphatic filariasis had context. Further, Dr. Paul Farmer MD, acclaimed anthropologist and physician, had uprooted to this same region years ago. I intended to use my gap-year in a meaningful way which might later give me strength and perspective during my anticipated life as a physician. Today, four years later, it is with this attitude that I reflect upon the 2010 earthquake, and am thankful for my role in one of the most extraordinary tragedies of the century. In the absence of a functioning hospital or any doctors, I was looked to as a physician. The frustration and impotence I felt that day as a first responder has guided me toward a career in emergency medicine. When the sun came up on Jan 13th, twelve hours after the first earthquake which immediately killed one hundred thousand and would be responsible for the deaths of one hundred and fifty thousand more, I considered how to be most useful. I was exhausted after a sleepless night of walking and hitchhiking the twenty miles from Port au Prince to Leogane, the city which turned out to be closest to the quake’s epicenter. Once back, searching through a partially collapsed Hospital St. Croix looking for friends and trying to call home occupied my time, not sleep. With the destruction of the town’s only hospital, locals began laying the wounded and dead in a field in front of a nursing school, hoping for any sort of expertise. I decided that distributing water and ibuprofen from my first aid kit to a field filled with compound fractures, head injuries, deep lacerations, and amputations, to name a few of the horrific injuries, was the most practical and useful thing for me. When I met an American nurse practitioner, Michelle Sare – founder of Nurses for Nurses International, and was asked to amputate a finger and start splinting arms and legs, my perception amongst the wounded changed. Family members begged me frantically to do something as their loved ones slowly died from internal bleeding, respiratory failure, and renal failure. That day was remarkable in every sense of the word. Two months of rotations in Memorial Hospital’s level one trauma center in South Bend, Indiana as a third year medical student confirmed my suspicion that emergency care is for me. I couldn’t help but marvel whenever I would see a patient with an injury similar to one I saw in Haiti. The pride that I take in knowing how to treat these acute injuries when confronted a second time is immense. I feel like a wizard when I am able to relieve pain with several well calculated thrusts, a splint, or some well-placed lidocaine. I hope to have more of these skills at my disposal so there will not be a crisis that I am unqualified to respond to. The most valuable opportunities that have come my way; a chance to volunteer in Haiti, a chance to study dengue fever in the amazon, a chance to work as a camp counselor in Colorado, have always been a result of my enthusiasm and hard work. These qualities, in addition to my unique motivation born out of natural disaster, give me reason to believe that I would make a great emergency physician. Regardless of the matching service’s determination, the moment I step off the plane in Port au Prince this June after graduation, I will be an emergency medicine doctor. A 40-something female came into our ED with some confusion, low BP, and tachycardia. EKG and labs were normal, but she continued to deteriorate despite appropriate treatments. The cardiology fellow was with me when she arrested, and despite ACLS protocol, we were unsuccessful in our resuscitative efforts. She was pronounced dead. As the cardiology fellow and I were discussing her case outside of the room, the monitor began to show a spontaneous rhythm. She regained a pulse and BP and was admitted. Later that day she arrested again and after unsuccessful efforts was pronounced dead (again)! Then she revisited her Lazerus process and spontaneously recovered. Her story: She said she was placing clothes in the washer when something bit her on the hand. She looked to see if her cat was in the washer and seeing that she was not, slammed the lid and ran the wash twice to be sure that whatever animal it was dead. Then carefully looking through the clothes while putting the clothes in the dryer, she found a limp and dead bat which she fished out with kitchen dishwashing gloves. At that point, she pulled a paper sack out of her handbag and set it on the counter. We went on with the physical and discussion of rabies testing and vaccine, when I noticed the bag was slowly moving in and out like something was breathing and the sack was rattling. I had visions of the creature getting out and flying all over the ER, being a nightmare to catch, exposing both staff and other patients as well as becoming a liability for the hospital. The normal bat containers, empty paint cans were in storage, and I knew that someone would have to go to the locker and get one taking at least 15 minutes. I needed a container now. I ran next door to the trauma room and grabbed a large suction canister and lid and put the sack in it. Now to humanely be sure that the bat was not a threat, we found a bottle of alcohol and poured it in through the suction hose connection. At least it could die in an alcohol stupor. The bag stopped moving and the paint canister arrived and the whole canister fit inside without opening it and off to the health department. 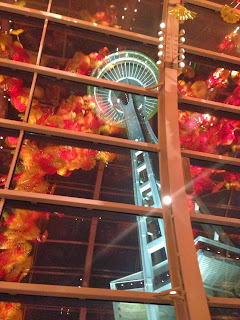 I was sitting in the atrium at the Chihuly Garden and Glass Museum in Seattle during the ACEP Scientific Assembly a couple of weeks ago enjoying a glass of wine and some fine appetizers, so it took me a moment to think about what my colleague was asking me. And, to be honest, I wasn’t sure if I could answer her question. I joked back, “Love is such a strong word…” But, her question really put me in a pensive mood. Did I still love it? At a time when more patients are going to the emergency department because they can’t find a primary doctor, or don’t have insurance or have just gotten insurance and have put off having any routine medical care until today, and at a time when government fund cutbacks mean stricter measures for payment of fees (i.e., if you don’t get good patient satisfaction scores, we’re not going to pay you) it’s hard to be an ED doc and not develop a certain level of cynicism. I’ve already written about my decision to return to Emergency Medicine after having trained in Surgery in prior posts. I wanted variety, continued challenges, the ability to go home at the end of my shift knowing I wouldn’t get called back into the hospital just as I was getting settled in for the night. And, for the most part, I do enjoy my job. But there are those days when I wonder if I wouldn’t be happier as a cashier… or a waitress… or….? I think about what my application would look like… Prior Work Experience: dealing daily with irrational people having unrealistic expectations and demanding all their problems get solved promptly. I guess maybe they’d tell me I was over qualified. Then I think about those moments of pure chaos, when you weren’t sure if you were making the right decision at the time, and you relied solely on pure guts and instinct with whisperings of medical knowledge; when both you and the patient came out slightly bruised and beaten on the other side but alive to fight another day. Those are the moments when you truly feel you have made a difference; that those 10 years of post-graduate education weren’t a waste of time. Find a job you enjoy, and you will never have to work a day in your life. She was young, pretty, and dead. Another victim of a head-on collision on a stretch of winding road outside of town where we get the great majority of MVC’s in the rural hospital in which I work. We knew it was going to be bad when we heard the ambulance traffic call out the “Code Three with one” as it was en route from the accident site. I can still hear her voice as she cheerily answered “Hi! Good morning!” Had I been in a different frame of mind, I would have taken the time to try to figure out how to find the actual number in her contact list. But, Monday morning quarterbacking aside, I did what my instincts told me to do at that moment. Once I said that her daughter had been in a serious accident, she immediately passed me off to the girl’s father “who was a doctor and would understand better.” I steadied my voice as I informed him that his daughter had died. I held the phone near my ear but somewhat away as the wails and cries filled the small space I was in. Their grief carrying across the hundreds of miles that separated us. They would come right away, he reassured me. I told him to take his time and await our phone call. There were other calls that had to be made. To CHP. To the donor network. To the coroner. After about an hour, my nursing supervisor told me the family was coming and would like to stop by the hospital to talk to me. Several hours and a multitude of patients later, they arrived. I spent some time with them explaining what I knew of the accident and about the resuscitation effort. As a doctor, he had a lot of questions and wanted to know everything in detail. Toward the end of the visit, I found out she had only recently moved and was actually working at one of our local shops. Then I remembered her. A bright, smiling girl who helped me with a purchase not even a week ago. I tried to wrap my head around that image and not of the broken patient who had been brought to my ED just hours earlier. I’m still trying. I think we’ve all experienced what I like to call “case envy.” Or even sometimes, “shift envy.” You come on and your colleague immediately starts telling you about the interesting case, or the polytrauma, or the fantastic save/diagnosis/procedure that they just completed. I sometimes hear the story and wonder what I might have done. Would I have handled things the same way? Is that the diagnostic approach I would have followed? Would I even have considered things the same way? Why don’t I ever get the cool cases…? In residency, we had one colleague who was the perpetual “Black Cloud.” Now, they got to see a lot of cool stuff. However, you didn’t want to follow them because you knew it was going to be chaos in the ED when you arrived. And, if you came before them, you knew the last part of your shift was going to start going to pot about an hour before the end of it. So maybe it’s not so bad being a bit of a white cloud… but still… I think we all like to have a little something that gets the juices flowing, the mind working, a bit of “yeah for me” moment… After all, that’s why we got into Emergency Medicine… at least for me… how about you? I know times are hard for a lot of people, but when you’re a 30-something, insulin-dependent, right AKA with non-healing wounds who social work bent over backward following your last admission to get you a clean place to live, home health care visits and arranged for a primary care physician so that you could regularly get medical care and, more importantly, your prescriptions, it’s poor form to miss appointments and get dropped from the practice. Yes, I know it’s easy to get kicked out of your place within a month for having a dog which wasn’t allowed in the first place and which you acquired AFTER you moved in. What home isn’t complete without a loving pet? And, since you couldn’t afford a place before because of your limited SSI, I am sure adding vet bills, dog feed, and vaccinations to your budget will be no problem at all. And, sure, having a significant other who doesn’t work and who smokes despite the no-smoking policy of the building management is a problem especially when they’re not supposed to be on the property either. Yes, darn those apartment landlords and their stupid rules. Now, I understand that you had previously been living in your car and had been lucky to have a nice place to live, but why couldn’t you drive that car to the appointment again? I’m sorry, you’re now having to live in it again… is it in working order? How did you get here again? What? It’s a legitimate question since you came 20 miles out of your way from your hometown to our E.D. Sure, yes, well, you’re in luck, we have no beds and are having to send all of our admissions north to our sister hospital. So, you’ll be closer to, um, home… and, besides, those social workers already know you and have done all of the leg work already, so there’s that too. Mark Twain once said, “Truth is stranger than fiction, but it is because Fiction is obliged to stick to possibilities; Truth isn’t.” Twain must have worked in an E.D. I can handle the abusive drunks. I can handle the tweekers who are “talkin’ to the devil.” I can handle the annoying drug seekers who are being seen for their weekly “dental pain” fix. But what I can’t seem to handle are the “walk in the door with my dead baby” parents. I understand this was baby number 8 or 9. I know you can’t remember which since you don’t have custody of any of your other children, and sure, that makes it harder to keep track. And, yeah, she was only 2 months old; you hadn’t quite gotten used to having her around. She still hadn’t quite fit into the household routine. Now, I know, she was a great baby because she slept through the night. And, yeah, who hasn’t put their baby to bed and then not checked on them for 15 hours. As long as they’re not crying, they’re fine, right? Yes, yes, I understand it was quite the family party and no one woke up before noon… or one… or two in the afternoon. I’m sure the baby was safe and sound on the bed with her full bottle from last night. As for medical care, sure, being weighed once at the WIC office and being told that she’s “nice and healthy” is exactly the same as being seen by a pediatrician. It’s almost as good as getting vaccinated. I know that you’re busy and just couldn’t quite get in to have her seen at the pediatrician’s office, but I am sure all of your child’s health needs were met during that visit so you could get your much-earned government support. Now, I have to let you know that I will be calling the local police, the coroner’s office, and Child Protective Services. They’re going to be asking a lot of questions. And, I know several of the maternity nurses are going to want some answers, too, when they find out that the “meth-addicted, breeds like a rabbit, that CPS was told about” at the time of your child’s birth is now bringing back that same child in not quite the same condition as when she left. But seriously now, I don’t mind doing a peri-mortem exam in the E.D. with the coroner’s official. I’ve done physical exams on lots of two month olds. Granted, they are not usually wearing wet, soiled onesies. They usually aren’t stone cold with obvious lividity set in. They generally are not brought in wrapped in foul, cigarette and eau de dog scented blankets. But, I am a professional. I can maintain a clinical distance while performing my duties. I know that the holidays can get really depressing for a lot of people, but I had three patients over the weekend that really got me depressed because of their situations. I always said that I would never make a good psychiatrist because I would tend to internalize and identify with my patients, and so that’s why I enjoyed surgery so much. There’s quite a bit of distancing that happens when you’re behind a mask looking at a square of skin. As an E.D. doc, though, we’re up close and personal with a lot of our patients, so it’s back to internalizing and not having the luxury of a sterile sheet between you and your patient. Patient One crashed their car. They are homeless, so their car is like their home. Everything they own is in there. They had just gotten kicked out of one “fleabag” motel and were on their way to find something better along the coast when they lost control on a curve. Now, all they have is the clothes on their backs. Well, actually in a hospital bag because they were stripped down to a hospital gown when they arrived. They’re bruised and battered and slightly torn. And, they have no one and no where to go. I can discharge them because, luckily, they didn’t suffer any major injuries. But, they have nothing. So they get admitted. Social Work and Discharge Planning can figure out what to do with them in the morning. They used to have a life, and friends, and a home. But then they were forced to take early retirement from their work. They lost their home and their social network. They can’t afford housing on a fixed income. So they roam… in their car… from place to place. Patient Two had a nice home, and a wife. Then their wife died and a part of them died too. So they turned to alcohol to help deal with the pain. Soon their nice home deteriorated as did their health. They have a neighbor who checks on them from time to time. Their neighbor brings them in whenever things get too bad. Patient Two can’t see their PCP because they have an outstanding bill, so the E.D. becomes their PCP. Diabetes out of control again? Yep. Bad cellulitis on your legs again? Yep. Anything new? Yep, pressure ulcers on my bottom from not getting up out of my chair for the last three days because my legs felt too bad. Am I going to be admitted? Yep. Patient Three has a psych history. They’ve been in and out of the system their entire life which is only 50+ years long so far. They have the look of a 90 year old man. A neighbor stopped by because they hadn’t seen them for a few days and found them looking slightly worse than usual. Not eating or drinking. Somehow, though, they continue to smoke despite the rattling cough in their lungs. How the cigarette paper doesn’t just rip their Sahara Desert dry and cracked lips to shreds is beyond me. Must be the warm stale beer that somehow is within reach. Another admission for “Failure to Thrive.” It’s the least I can do. You are currently browsing the archives for the TheCentralLine.org category.